Whether you're traveling, at a remote destination, or simply sitting on your couch, we want to make sure you're getting the most out of the internal battery in your GNARBOX. External hard drives pull a great deal of power from the GNARBOX. We recommend only using them during transfer and then promptly ejecting when done. If you don't intend on immediately editing your videos, be sure to power the GNARBOX off after video import. This prevents the GNARBOX from spending time (and battery) transcoding the video files. Charging other devices off of the GNARBOX (ie: your phone) will drain the battery faster. If you're editing on your GNARBOX and you're near a power source, it's totally fine to charge the GNARBOX while editing. Just make sure you unplug it from the power source before doing any file transfers, exports or before plugging in an external hard drive. ** = HDD refers to spinning disk drives, while SDD refers to solid state drives (non-spinning hard drives). 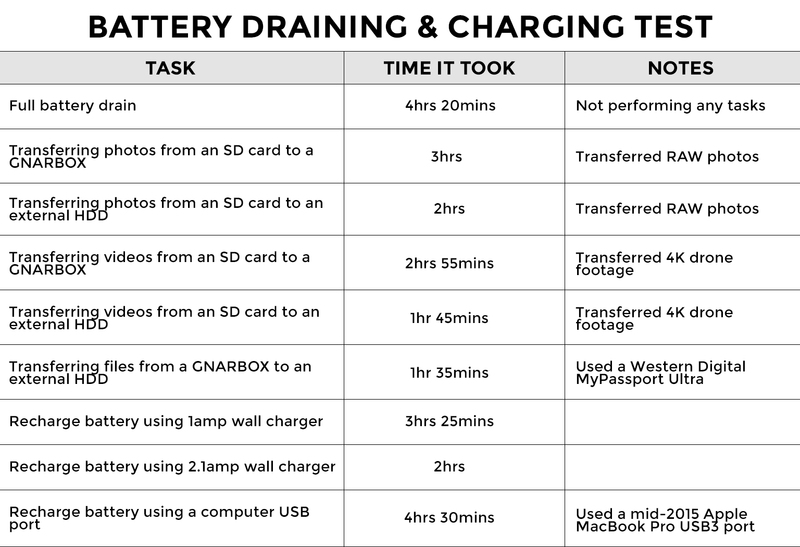 The chart below maps out the results of a battery draining test we created in our office. This should help give you an understanding of recharge and draining speeds across different activities and voltages. In some cases where a firmware update fails or a GNARBOX has not been utilized frequently, the battery can appear to be non-responsive. This usually means the battery needs a little kick to get up and running again. Charging your GNARBOX for 48hrs can usually give your battery the kick that it needs. If it's been a while since you've powered your GNARBOX on or if your GNARBOX just doesn't seem to want to power up, give it a full 48hr charge to restore the battery. As always, we're here to help solve your GNARBOX related issues, so if you're unable to find the answer you're looking for on help.gnarbox.com, feel free to shoot us a message using the chat window found in the bottom right corner of the page or email us at support@gnarbox.com!